Quite a few years ago when my kids were little, I remember when they transitioned from formula or milk to baby food and then eventually more solid or normal foods like you and I eat. If they stayed with just formula or milk alone their growth wouldn't be sufficient as it wasn't enough as they grew and became more active. They would be hungry non-stop like they were when they were babies and they'd never be satisfied. I can't imagine at the age they are now if they only drank milk and ate baby food! Wouldn't be a good picture of health as their growth would have been or would be stunted...and if you have teenagers or early twenty somethings you know they are ALWAYS hungry! How about you and I!? Life would definitely be completely different on a liquid or soft food / baby food diet. You might lose some needed weight but you wouldn't be satisfied. The other thing I remember about the baby food stage...is that it was quite messy at times and there were also times where if we purchased store bought baby food that every so often for one reason or another there was a recall on baby foods. It's a good thing those companies were paying attention as sometimes it led to serious health related issues and other times it was just precautionary but either way it was necessary. The Church Is In Need of A Health Checkup: As I look at the life of follower's of Christ and current status of at least many in Western Christianity, I realize we are in a crisis situation within the Church and we need God to help bring revival or a new reformation to the church. On one hand, as stark as this is we can't be completely surprised by this because as the writer of Hebrews warned against apostasy. (see Hebrews 5:11-14) It's as if he was speaking to the church today as so many churches have changed from preaching the whole council of the Gospel, (Entire Bible...the real meat of the Word) for soft...watered down..baby food messages. Furthermore, the so called "Pulpit" in many churches has been replaced with the next great program and coinciding messages aimed at filling the pews with what is sometimes called edutainment. Don't get me wrong, there is aspects of teaching and preaching that are entertaining and should but but the result is that people aren't encouraged as much to read and study the Word of God ourselves and for the churches that seemed to have traded the Word of God for baby food, feel good, and in some cases politically correct messages. It's no surprise that true disciples of Christ are not being created. If you were fed baby food your entire life...you most likely would continue to do so. Related to this since it's about taking God's Word seriously and about the qualifications and warnings set for...there are also in some cases baby Christians "leading" flocks when they don't even rightly know what they believe themselves or why they believe! All the more reason to be in the Word and pray for the leadership of our local churches as they need to be in the Word and be actively growing in Christ...in the wisdom and knowledge of Him if they are to truly lead the local flocks! If we are truly leading people to Christ...what foundation are we bringing them into? A growing foundation that is based on Christ and His Word with the Holy Spirit leading or something else that is much less than this? Time for a Recall: Friend, if you're a true follower of Christ it's time to make a call for a permanent recall on spiritual baby food in your life, your church and community and the recall starts with you! Ultimately it's your responsibility to read, study, abide and rightly divide God's Word. It's your responsibly to grow in the wisdom and knowledge of Christ and actively take His Word and live it out! No one else can do that for you...they can influence you, encourage you and help you grow but no one can make you grow or do these things. We're called to preach the Word and be ready in season and out of season (See 2 Timothy 4:2) so, how will we do that without Word of God active and alive (See Hebrews 4:12) in us as His Word is alive and Jesus and The Word are our foundation? We're also called to be doers and not just hearers of the Word. (James 1:22) So, how are we to live this out if the Word of God isn't actually in us?! The fundamental question that begs to be asked is: "Are we going to take God and His Word Seriously or not?" 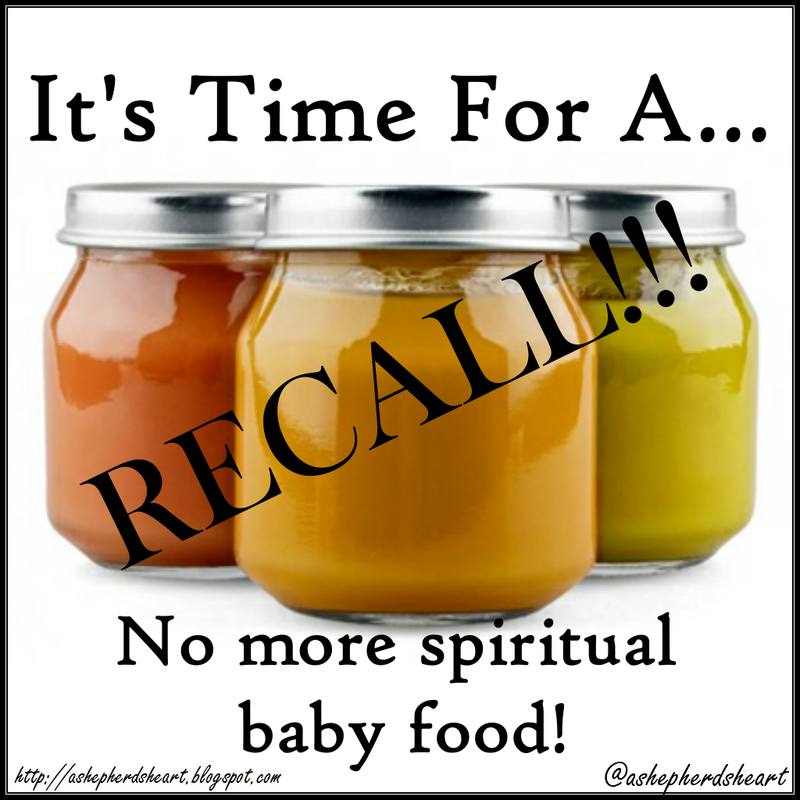 If so...it's time to, again, permanently recall the "baby food" we've been taking in from our pulpits, podcasts, or in our sometimes non-existent daily abiding in God's Word. Whether or not your home church does this it's time for you as a follower of Christ to pick up your Bible, read and study it for yourself and let it speak life back into every corner of your being for His King and Glory and for your good and help others do the same. Enough is enough...no more baby food!